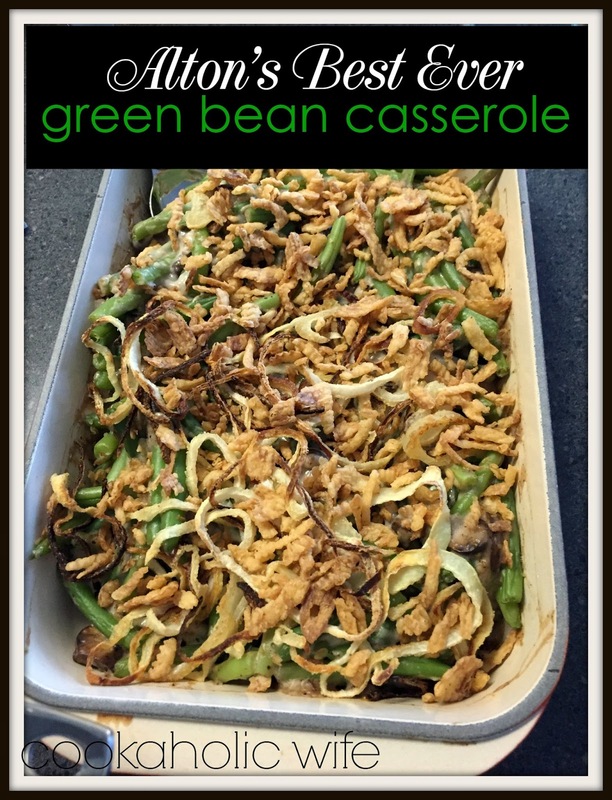 Green bean casserole is one of those classic holiday dishes that you either love or hate. And usually if you hate it, its because you have a serious dislike of either mushrooms or cream of mushroom soup. If you dislike mushrooms, I totally understand but I think you should still try this anyway because it doesn’t taste like a mushroom and if you make it, you can be certain that your mushrooms are cleaned properly. If you dislike green bean casserole because of cream of mushroom soup, than I totally understand. That stuff is kind of scary, coming out of the can all gelatinous in hunks with tidbits of mushrooms mushed in there…yeah I’d skip it too. But this recipe calls for fresh mushrooms and I can promise you there is a complete difference in the taste! 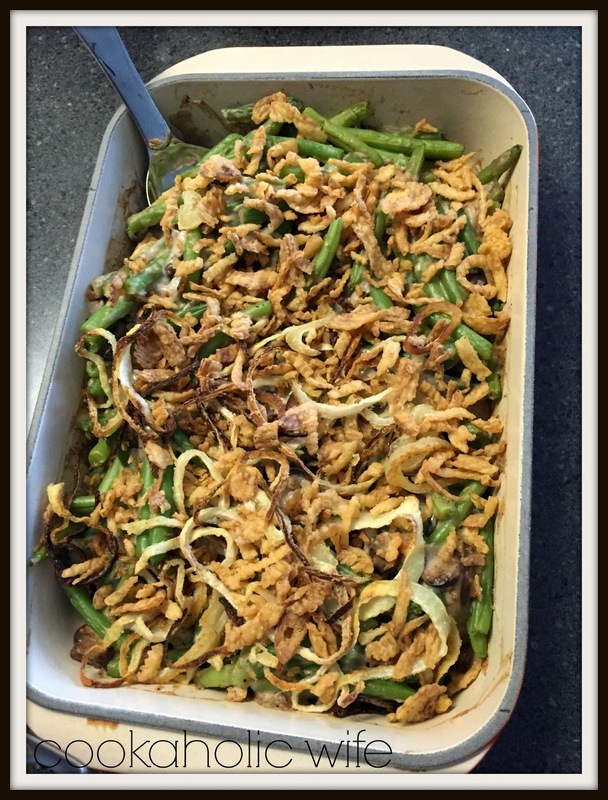 Actually, even the onions on the top of this dish are made from scratch and not from a can or bag, so it’s even more of a reason why I think you should make this dish, regardless of if it’s for the holidays or not, and see just how much tastier green bean casserole can be using fresh ingredients. Plus, I think you’d make Alton happy if you liked his recipe since he calls it the best ever. 1. Preheat the oven to 475 degrees. Spray a large baking sheet with cooking spray. 2. Combine the flour, panko and salt together in a shallow dish. Toss the onions in the mixture and then place on the prepared baking sheet. Spray the onions with cooking spray. 3. Bake for 30 minutes, tossing the onions every 10 minutes, until golden brown. Set aside until ready to use. 4. Lower the oven temperature to 400 degrees. 5. Prepare the green beans by bringing a large pot of salted water to a boil. Add the green beans and blanch for 5 minutes, then drain in a colander and immediately place in a bowl full of ice water to stop the cooking process. Drain and set aside. 6. Melt the butter in a large skillet over medium heat. Add the mushrooms and cook for 4-5 minutes or until the mushrooms have released their liquid. Add the garlic and nutmeg and cook for another 1-2 minutes. 7. Sprinkle the mushroom mixture with flour, salt and pepper, and stir to combine until everything is coated. Add the chicken broth and simmer for 1 minute then add in the half-and-half and stir, allowing the mixture to combine. Simmer until it has thickened, approximately 6-8 minutes. 8. Spray a 9×13 baking dish with cooking spray. Layer the green beans and pour the mushroom mixture on top. Stir to combine. 9. Top with the onions and bake for 15 minutes or until bubbly. Holiday Tip: You can make the onions in advance and let them cool completely before transferring to a sealable bag. The green beans and mushrooms can be prepared and placed into the baking dish the day before and refrigerated. To cook, allow to come to room temperature for 30 minutes before placing in the oven.